The real issue from a clinical and infection control viewpoint is CPE. 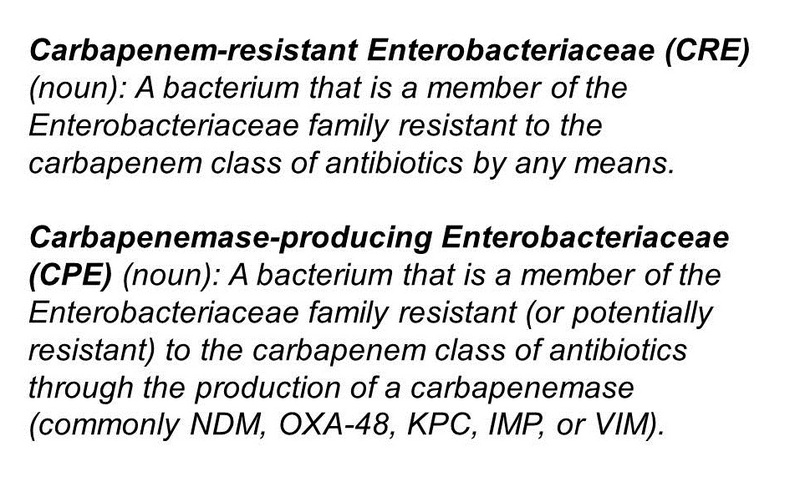 Enterobacteriaceae that are resistant to carbapenems by means other than an acquired carbapenemase (i.e. CRE that are not carbapenemase producers) are important, but they don’t seem to have the same capacity to spread as carbapenemase producers. I still think that “CRO/CPO” is not the way to go, given the gulf in epidemiology between the Enterobacteriaceae and the non-fermenters (although, sometimes, begrudgingly, you have to go there). What I mean by this is that you will sometimes detect a carbapenemase gene from a PCR but don’t yet know whether it is from a non-fermenter or Enterobacteriaceae species. In this circumstance, this has to go down as a ‘CPO’. Don’t you think that is comfusing changing the acronyms all the time, even if you want to include more R enzymes Jon?